Partial funding for this performance is provided by the National Endowment for the Arts and the Western Jazz Presenters Network. At 26, pianist Gerald Clayton, the Netherlands-born son of LA bassist John Clayton, is one of the most talented of jazz up-and-comers. He is winning renown for his seamless embrace of everything from stride piano to 21st-century neo-soul. The Down Beat 2008 Readers’ Poll named him one of the top pianists to watch. The Jazz Gallery in New York commissioned a composition from him, while the BBC Orchestra has performed another. 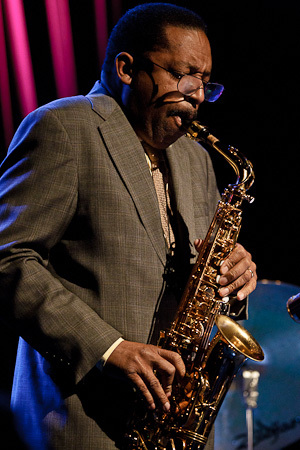 His honors, still early in his career, include a prestigious award from the National Foundation for the Advancement of the Arts, the title “Presidential Scholar in the Arts,” and second place in the Thelonious Monk Institute Jazz Piano Competition. 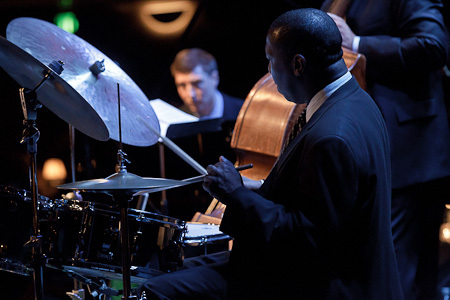 Clayton released his acclaimed debut recording as a leader, Two Shade, in 2009 on the fan-funded label, ArtistShare, with trio mates bassist Joe Sanders and drummer Justin Brown. It justified the praise that jazz critics had been according him – glowing assessments such as “Oscar-Peterson like style” and “huge, authoritative presence” (New York Times). 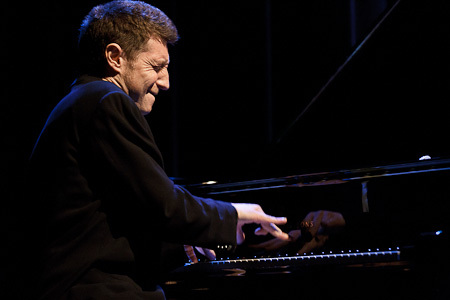 With praise like that, Clayton’s reputation has quickly grown as one of the most accomplished and stylish pianists in jazz’s younger ranks. His playing is solidly grounded in popular jazz styles with hints of more recent forms such as neo-soul and hip-hop, and he renders his amalgam with an embracing swing and style. The Lionel Hampton International Jazz Festival in Moscow, Idaho, where jazz masters mentor and adjudicate student jazz musicians, concluded Saturday. Many Seattle-area instrumentalists were honored Saturday by invitations to the Young Artists Concert. They included the South Whidbey High School band and Combo, division A, directed by Chris Harshaman, from Langley; the Eckstein Middle School Ensemble, Middle School division, directed by Moc Escobedo; and the Garfield High School Ensemble II, division AAAA, directed by Clarence Acox. Honorable mention went to the Eckstein Middle School Combo II, Middle School division, directed by Moc Escobedo. Musicians honored by an invitation to play in the intimate setting of “Hamp’s Club” included Mike Laven, drums, and Eric Dubbury, trumpet, Edmonds-Woodway High School, directed by Jake Bergevin; Luke Woodle, drums, Eckstein Middle School, directed by Moc Escobedo; Gus Comstock, drums, Ian Frost, soprano saxophone, Adam Stansell, saxophone, Emmitt Akeley, guitar, Ian Zapolsky, piano, Willem de Koch, trombone, Garfield High School, directed by Clarence Acox; Elliott Clement, piano, Hamilton International Middle School, directed by Dan Rowe; Xavier DelCastillo, tenor saxophone, Matt Nuntz, bass, Lucas Winter, guitar, and Adrian Noteboom, tenor saxophone, Roosevelt High School, directed by Scott Brown. Northwest University, in Kirkland, was honored by the festival with the gift of a drum set. Two Seattle-area high-school jazz bands have made it to finals of the Essentially Ellington competition. Roosevelt High School, in Seattle, and Mountlake Terrace High School will both compete against 13 other bands May 12-14 at New York City’s Jazz at Lincoln Center, which sponsors the competition. Garfield High School, which has won the national contest four times (more than any other group), did not make the finals. It is the only time other than 2001 when Garfield didn’t make the cut. Roosevelt High School has won the competition three times and, except for 2003, has made the finals every year since the 16-year-old event began accepting contestants west of the Mississippi in 1999. Mountlake Terrace has made the finals five times and it came in third in 2005. Seattle-area bands have dominated the competition over the years, winning first place seven times. 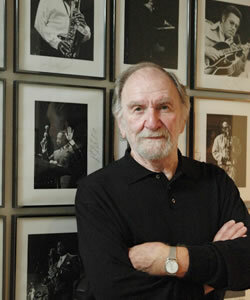 We received word that Seattle resident and internationally known jazz photographer Ron Hudson passed away this morning. There is a memorial service being planned soon and we will post information as soon as we have it. Please take a moment to check out the great story on Ron done by Katy Bourne which was published on AllAboutJazz.com. Summing up the career of a man as extraordinary as jazz photographer Ron Hudson is an intimidating proposition. He has spent the past thirty-plus years photographing some of jazz’s brightest dignitaries, capturing moments and committing them to history. He’s also heard some great music along the way. One of the first things that caught my eye was a wall with about a dozen photographs of some of jazz’s brightest figures: Dizzy Gillespie, Miles Davis, Joe Williams, Milt Jackson and Shelly Manne to name a few. All of the images were signed, some with personal notes to Hudson and some with a simple signature, or as in the case of Miles Davis, a signature and a dotted quarter note. But, Vu’s view of this music is light years away from that of Coleman Hawkins, Charlie Parker and Chet Baker. Instead, Vu drapes these familiar melodies over an often writhing, anxious undercurrent of rhythm and dynamic created by the double electric bass pairing of Bergman and Stomu Takeishi, along with drummer Ted Poor. The stark juxtaposition of the familiar with the chaotic deepens understanding of the melody. Vu introduces what he is trying to do with the familiar before venturing into the unfamiliar, to provide a better understanding of his vision. 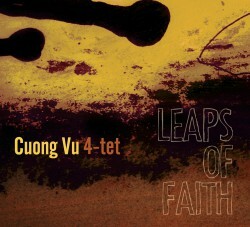 Vu furthers his approach with the title piece, “Leaps of Faith” whose harmonic form and overall architecture are based on John Coltrane’s “Giant Steps.” Vu, like Charlie Parker did before him with “Embraceable You,” sets up a new melody while the band sets a dramatically different stage for the composition. In this, Vu achieves perfection in his approach. The first three standards are studies in comparisons and contrasts. “Body and Soul” proceeds in a moody, ethereal space, one that captures the emotional landscape of the lyrics in a 2001: A Space Odyssey (MGM, 1968) sort of way. The same is true of “All The Things You Are” cast almost as a backdrop for a remake of A Clockwork Orange (Warner Brothers, 1971) only with a bright and shiny storyline. “My Funny Valentine” would sound perfectly at home in the soundtrack of Blue Velvet (Paramount, 1986), so spacious and omnipotent is the soundscape created by this odd ensemble. Vu’s trumpet veers more to the plaintive, long-noted tone of Tomasz Stanko than the tart midrange of Miles Davis and acolytes after him. Vu is best understood in the aforementioned “Valentine,” George Harrison’s “Something” and, in a fit of genre- harvesting brilliance, Jackson Browne’s “My Opening Farewell.” This music is the collision between the secure and consonant with the disruptive and dissonant: meaning it reflects real life, where there are no white picket fences, only chain-link ones protecting paradise. The Benny Green Trio (with Peter Washington on bass and Kenny Washington on drums) with special guest Donald Harrison at Jazz Alley. from Earshot Jazz: Anat Fort’s music can subtly hint at her geographical origins. Born near Tel Aviv, she studied classical piano as a child and began improvising from an early age, all the while remaining open to the many musical sounds of her environment. 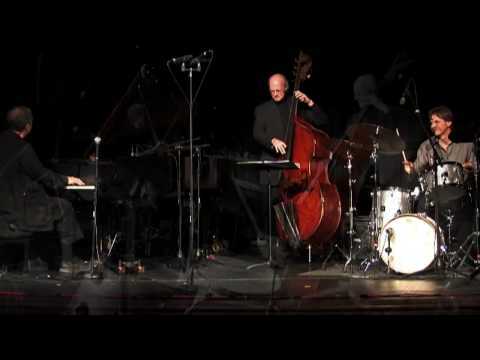 She brings her trio to Dimitriou’s Jazz Alley after a date on this year’s Portland Jazz Festival. In the early 1990’s, Anat came to the United States to study jazz, looking to balance a natural tendency towards freer playing with a firm grounding in the tradition. Her sojourn resulted in her self-produced debut album Peel, and commissions to write for various ensembles including chamber and chorus and orchestra. Her most recent commission was premiered at the Opera House in Tel Aviv in January 2006. Anat received two artist-in-residence grants from the Jerome Foundation as well as the Creative Connections award from Meet the Composer. A session recorded with drummer Paul Motian, bassist Ed Schuller, and clarinetist Perry Robinson was brought to the attention of the legendary producer Manfred Eicher ECM Records, and the resultant CD was released in 2007 as A Long Story. An important presence on the NYC alternative jazz scene and equally highly regarded in her homeland, Anat currently splits her time between Israel and the US and performs with bassist Gary Wang and drummer Roland Schneider in her touring band, the Anat Fort Trio. 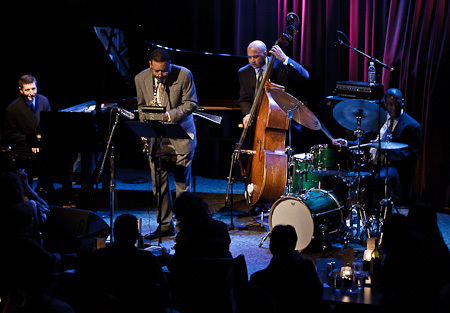 The Portland Jazz Festival, which kicks off Friday, often hangs its shows on a thematic frame. Past themes have been the historic legacy of Blue Note and ECM records and the explosion of new jazz from Scandinavia. For 2011, the theme is Bridges and Boundaries: Jewish & African Americans Playing Jazz Together. It’s a rich idea, though not particularly well fleshed out in the programming and also oddly irrelevant to Portland, which, according to the U.S. Census has one of the smallest African-American populations of any major American city and a small (less than 1 percent) Jewish population, as well. But theme aside, artistic director Bill Royston, as always, has booked a great lineup. Esperanza Spalding, the thrilling, Portland-raised bassist and singer who [won the Best New Artist Grammy], is the festival’s official Artistic and Community Ambassador. The Cohen siblings, from Israel — clarinetist and saxophonist Anat, trumpeter Avishai and saxophonist Yuval — are on the bill, as are clarinetist Don Byron (appropriately reprising his brilliant Mickey Katz project of daffy popular Jewish music), violinist Regina Carter, pianist Randy Weston, tenor saxophonist Joshua Redman and the SF Jazz Collective. George Shearing, the British jazz pianist and composer who wrote the bebop standard “Lullaby of Birdland,” died on Monday, February 14 in New York City, where he had resided for many years. The cause of death was heart failure. He was 91.